Venous thromboembolic disease is a major cause of morbidity and mortality worldwide and is comprised of two main conditions: deep vein thrombosis (DVT) and pulmonary embolism (PE). Its exact incidence is uncertain, but the incidence of first time venous thromboembolism (VTE) in the United States is estimated at approximately 100 persons per 100, 000 each year.1 Multiple factors result in increased incidence of VTE, including advanced age, race (higher prevalence in Caucasians and African Americans), and presence of risk factors, such as cancer, surgery, trauma, inherited thrombophilic states, and immobilization. Approximately 25-50% of cases are considered idiopathic, 15-25% are associated with cancer, and approximately 20% occur after surgery. The 30-day incidence of death after treated VTE is approximately 6% for DVT and 12% for PE.1 Pulmonary embolism can occur in 50% to 60% of patients with untreated DVT with an associated mortality rate of 25% to 30%.2 Clinical diagnosis of VTE can be difficult and unreliable as presenting symptoms can be caused by a multitude of other etiologies. Once diagnosed, treatment decisions are based on the location and extent of disease, severity of symptoms, physiologic sequelae, and underlying risk factors. Diagnostic and interventional radiologists play crucial roles in the diagnosis and management of VTE. Diagnostic criteria for direct evidence of thrombus are loss of compression and visualization of intraluminal filling defect on gray scale imaging, which is usually expansile and may be hypoechoic or echogenic (Fig. 1). 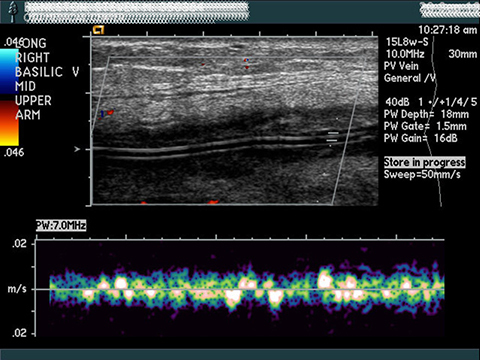 These primary findings are combined with color Doppler imaging and augmentation with duplex (if no thrombus is visualized), which provide indirect evidence of thrombus.4 In the upper extremity, compression can be used for the jugular, axillary, basilic, cephalic, and brachial veins. Although Doppler interrogation of the subclavian vein can be performed, the examination is limited due to osseous structures obscuring the vasculature and preventing use of compression. Magnetic resonance venography can also be used for evaluation of the central veins of the chest, the pelvic veins, and veins of the thigh when ultrasound is non-diagnostic.2,4 Approaches included black-blood and flow-based or contrast-enhanced bright blood techniques. 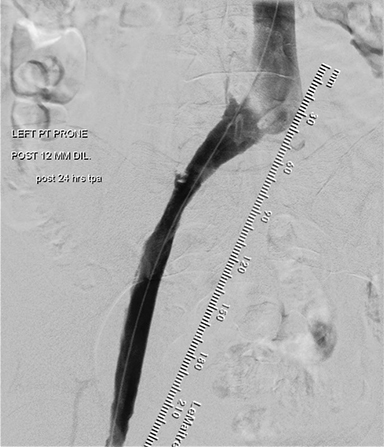 Although catheter angiography is considered the gold standard for diagnosis of pulmonary embolism, it has been replaced by CTPA as the test of choice and standard of care for the diagnosis of PE.6 Detection of pulmonary emboli to the level of the subsegmental arteries using thin-slice multidetector CTPA has been found in recent studies to have a sensitivity of 96%- 100% and a specificity of 89%-98%.7,8 Emboli present as filling defects within the pulmonary arterial system when an adequate contrast bolus is achieved (Fig. 4). Radionuclide ventilation/perfusion scans are an alternative if CTPA is contraindicated or results are inconclusive.6 Posterior-anterior (PA) and lateral chest radiographs are an important component of the study to exclude other causes of chest pain or shortness of breath and is required for accurate interpretation of abnormal radionuclide ventilation/perfusion scans. 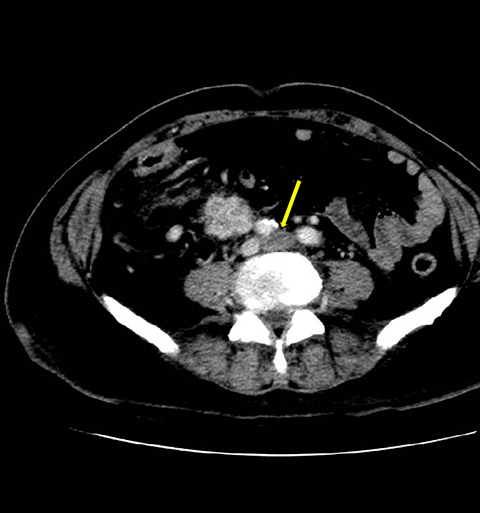 Inferior vena cava (IVC) filters also play a role in the management of VTE in certain settings. In patients with VTE and contraindications to anticoagulation, those who experienced a complication of anticoagulation, cases where adequate anticoagulation could not be achieved, or patients with recurrent embolus despite anticoagulation, IVC filters are considered an absolute indication.11 Proposed relative indications for IVC filters include prophylactic use in patients with major trauma; those undergoing hip or knee replacement with compromised cardiopulmonary reserve; pregnant women with DVT; burn patients; patients undergoing thrombectomy, embolectomy, or thrombolysis; and in patients with free-floating iliofemoral thrombus.11-13 Other prophylactic use is considered controversial. Interventional and diagnostic radiologists play key roles in the diagnosis and management of VTE. 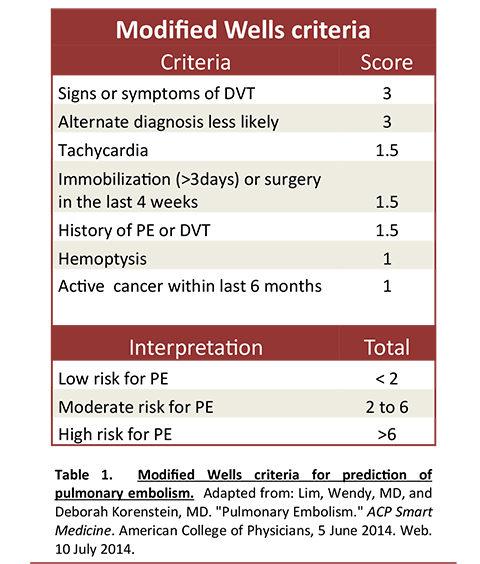 Multiple imaging modalities are available for the diagnosis of VTE, but ultrasound and CT pulmonary angiography are the standards of care for imaging diagnosis of proximal DVT and PE, respectively. Accurate diagnosis of VTE is critical in treatment planning. The treatment of choice for non-life- threatening PE and proximal extremity DVT is anticoagulation. Catheter-directed therapy for DVT and PE is employed for mechanical and/or pharmacologic thrombolysis in specified clinical settings. White, RH. The epidemiology of venous thromboembolism. Circulation 2003;107:I4-18. Subramaniam RM, Chou T, Heath R, et al. Importance of pretest probability score and d-dimer assay before sonography for lower limb venous thrombosis. Am J Roentgenol 2006; 186:206-212. Desjardins B, Rybicki FJ, Hyun KS, et al. ACR appropriateness criteria suspected upper extremity deep vein thrombosis. J Am Coll Radiol 2012;9;613-619. Krishan S, Panditaratne N, Verma R, et al. Incremental value of CT venography combined with pulmonary CT angiography for the detection of thromboembolic disease: systematic review and meta-analysis. Am J Roentgenol 2011;196;1065-1072. Coche E, Verschuran F, Keyeux A, et al. Diagnosis of acute pulmonary embolism in outpatients: comparison of thin- collimations multi-detector row spiral CT and planar ventilation-perfusion scintigraphy. Radiology 2003;229:757-765. Winer-Muram HT, Rydberg J, Johnson MS, et al. 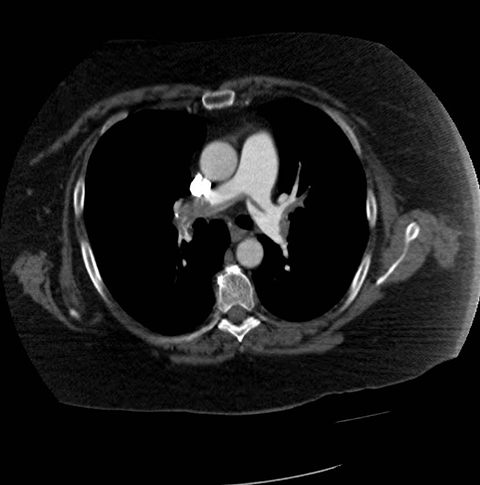 Suspected acute pulmonary embolism: evaluation with multi-detector row CT versus digital subtraction pulmonary arteriography. Radiology 2004;233:806-815. Cronin CG, Lohan, DG, Keane M, et al. Prevalence and significance of asymptomatic venous thromboembolic disease found on oncologic staging CT. Am J Roentgenol 2007;189:162-170. Kearon C, Akl EA, Comerota AJ, et al. Antithrombotic therapy and prevention of thrombosis, 9th ed: American College of Chest Physicians evidence-based clinical practice guidelines. Antithrombotic Therapy for VTE Disease. Chest 2012; 141(2) (Suppl):e419S–e494S. Kinney TB, Aryafar H, Ray CE, et al. Expert Panel on Interventional Radiology. 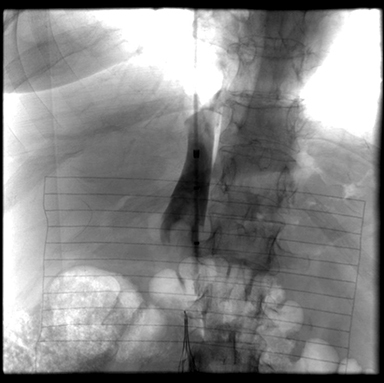 ACR appropriateness criteria radiologic management of inferior vena cava filters. American College of Radiology (ACR) 2012:1-12. Kaufman JA, Kinney TB, Streiff MB, et al. Guidelines for the use of retrievable and convertable vena cava filters: report from the Society of Interventional Radiology Multidisciplinary Consensus Conference. J Vasc Interv Radiol 2006; 17:449-459. Caplin DM, Nikolic B, Kalva SP, et al. Quality improvement guidelines for the performance of inferior vena cava filter placement for the prevention of pulmonary embolism. J Vasc Interv Radiol 2011; 22:1499-1506. Jaff MR, McMurtry MS, Archer SL, et al. Management of massive and submassive pulmonary embolism, iliofemoral deep vein thrombosis, and chronic thromboembolic pulmonary hypertension: a scientific statement from the American Heart Association. Circulation. 2011;123:1788-1830. Badlwin ZK, Comerota AJ, Schwartz LB. 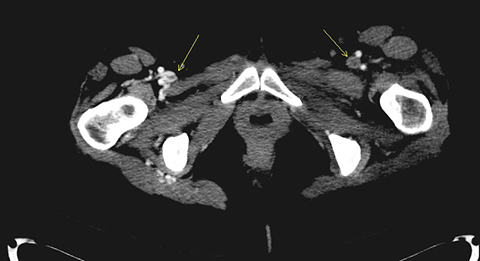 Catheter-directed thrombolysis for deep venous thrombosis. 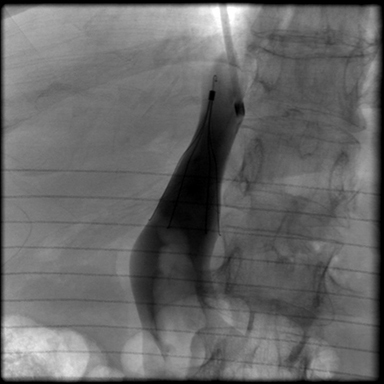 Vasc Endovasc Surg 2004 38:1-9. Patterson BO, Hinchliffe R, Loftus IM, et al. Indications for catheter-directed thrombolysis in the management of acute proximal deep venous thrombosis. Arterioscler Thromb Vasc Biol 2010;30:669-674. Vedanthem S, Thorpe PE, Cardella JF, et al. Quality improvement guidelines for the treatment of lower extremity deep vein thrombosis with use of endovascular thrombus removal. J Vasc Interv Radiol 2006; 17:43-448. Semba CP, Dake MD. 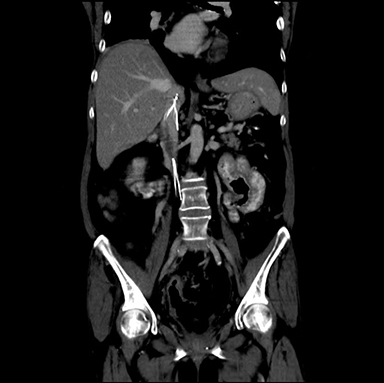 Iliofemoral deep venous thrombosis: aggressive therapy with catheter directed thrombolysis. Radiology1994: 487-494. Kennedy RJ, Kennedy HH, Dunfee BL. Thrombus resolution and hemodynamic recovery using ultrasound-accelerated thrombolysis in acute pulmonary embolism. J Vasc Interv Radiol 2013; 24:841-848. Weber J. Venous Thromboembolic Disease. J Am Osteopath Coll Radiol. 2014;3(3):2-7. Dr. Weber works with Diagnostic Imaging Associates, Oklahoma State University Medical Center, Tulsa, OK.